New Porsche 911 in detail | What Car? This is the all-new Porsche 911. Leaked images of the car were revealed last week, but Porsche has now released full details and prices. Everything is new but, as ever, the 911s styling has evolved only subtly. Porsche says that the 911s compact exterior dimensions have been retained, although hasnt released details of the new models dimensions. The proportions have changed slightly: the wheelbase is 100mm longer, for improved stability and greater interior space, while there are shorter front and rear overhangs and a lower roofline. At the front, there are familiar round headlights and slim indicator lamps at the top of each air intake. Theres a lower-slung look than before, though; an impression enhanced by a wider front track. The profile and side windows appear all-but identical to the current cars, but the side mirrors are now mounted on the door, rather than at the front of the windows. The biggest changes are at the rear, with slimmer tail lamps and a wider engine cover that allows for a larger pop-up spoiler. The new body is stiffer than before and, thanks to the use of more aluminium in its construction, lighter by up to 45kg. As ever, the 911 has rear-mounted six-cylinder engines. The latest units are more powerful, but also more efficient, with fuel consumption and CO2 emissions for all versions that are up to 16% lower than the current cars. A start-stop system and energy-recuperation system now come as standard. Theres also a seven-speed manual gearbox, which Porsche claims is a world first. The entry-level Carrera model has a 3.4-litre, 345bhp engine, whereas the Carrera S has a 395bhp 3.8. With the optional PDK semi-automatic gearbox the Carrera has CO2 emissions of 194g/km the first 911 with CO2 emissions below 200g/km. As with its exterior, the 911s cabin isnt a major departure from the current cars. Porsche says that it takes its cue from the Carrera GT, with a design that mixes elements of the current car with Porsches newer models such as the Cayenne and Panamera. The new Porsche 911 is available to order now, with first customer deliveries expected in mid-December. The 911 Carrera starts at 71,449 and has standard equipment that includes leather trim, xenon headlights and satellite-navigation. 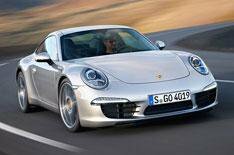 Carrera S prices start at 81,242. Extra standard equipment includes Porsche Active Suspension Management and Porsche Torque Vectoring. Porsche is expected to roll out more 911 derivatives next year. Four-wheel drive, Cabriolet, Targa and Turbo models are all expected.